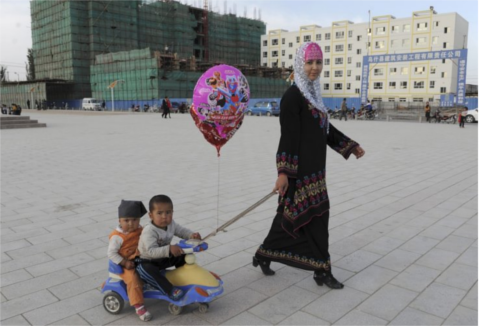 Prospective parents in China's Xinjiang region – home to 10 of the country's 23 million Muslims – will now have to consult a list of banned Islamic baby names or risk long-lasting consequences, it has been reported. While names with religious meanings are used by Muslims around the world, authorities in the north-western region of Xinjiang have compiled a catalogue of names deemed to be "overly religious", the US-funded Radio Free Asia (RFA) reported. Children with a banned name would be barred from the household registration system, or Hukou, which is necessary to access social services, healthcare and education. Prohibited names include Islam, Quran, Mecca, Jihad, Imam, Saddam, Hajj and Medina amongst others. The ban falls under the Chinese Communist Party's "Naming Rules for Ethnic Minorities", an official confirmed. "You're not allowed to give names with a strong religious flavour, such as Jihad or names like that," an official told RFA. "The most important thing here is the connotations of the name ... [it must not have] connotations of holy war or of splittism [Xinjiang independence]." The official added: "Just stick to the party line, and you'll be fine. [People with banned names] won't be able to get a household registration, so they will find out from the hukou office when the time comes." However, names considered to be "mainstream", like Mehmet, are acceptable. Human Rights Watch (HRW) condemned the "absurd restriction" by authorities claiming to combat extremism. "This is just the latest in a slew of new regulations restricting religious freedom in the name of countering 'religious extremism,'" the organisation's China director, Sophie Richardson, said. "On 1 April, Xinjiang authorities imposed new rules prohibiting the wearing of 'abnormal' beards or veils in public places, and imposing punishments for refusing to watch state TV or radio programs," added Richardson. "These policies are blatant violations of domestic and international protections on the rights to freedom of belief and expression." Xinjiang is home to China's Uighur minority, a Muslim community that says it faces discrimination. Several bloody clashes have erupted over the years and Beijing blames the violence on Islamist separatists and militants. HRW warned authorities that "farcically repressive policies and punishments" would only serve to deepen resentment among Uighurs, who complain of dire restrictions around religion and freedom of expression. "If the government is serious about bringing stability and harmony to the region as it claims, it should roll back – not double down on – repressive policies," said Richardson.